I love traditions and routines... so once the holidays hit I love revisiting favorite memories and places and activities! Sometimes certain traditions need to stop because they actually aren't fun... they just look picturesque in my head. As we are anticipating the arrival of baby #3 at the beginning of next month, I'm slowing down a little bit and feel less interested in keeping up the harried pace of traditional Fall holiday activities. I do however want to make a lot of memories this Fall and have a good time together as a family... so I have decided that I need to be intentional about it or it won't happen! I'll just end up looking back on October and it will be a blur of doing laundry, cleaning my house, and doing nothing extra special. Today I am going to share my Top 10 Fall Traditions that we plan to experience during the next month... (and a few that we've already accomplished... because I love being able to check things off my "to do" list! ;)). 1. 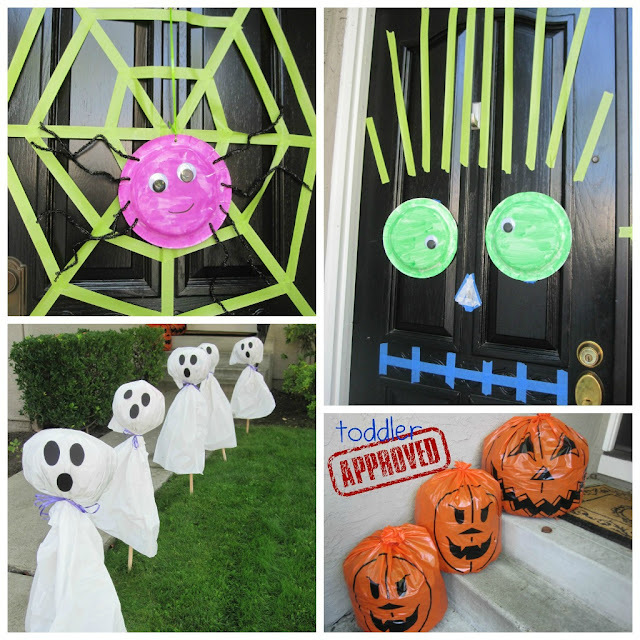 Decorate our house for Fall/Halloween... inside and out! We started already with the Fall sparkly leave garland above. Last year we made outside our house super creepy (see below)... so tomorrow we'll be brainstorming the plan for this year! This has already happened and it will be definitely happening again. We love making pumpkin bars. 3. Have a caramel apple bar! I love this caramel apple bar idea from Pinterest. When EJ and I lived closer together we used to make caramel apples and basically get sick from eating far too many autumn mix M&Ms and caramels. My kids have loved the tradition (not the getting sick part)... so it will continue! 4. Go on a Hay Ride. This is one of those traditions that I don't love... but my kids do, so I put up with it. We get to go on a hay ride at our preschool field trip this next week. Hurray! 5. Go to the Pumpkin Patch. I have a feeling we will do this several times over the next month. The kids love the corn pit at the local pumpkin patch, so we get to go there next week with school. My husband usually likes to join in too... so we may go twice! 6. Make No Carve Pumpkins. We did this last year and it was a hit. 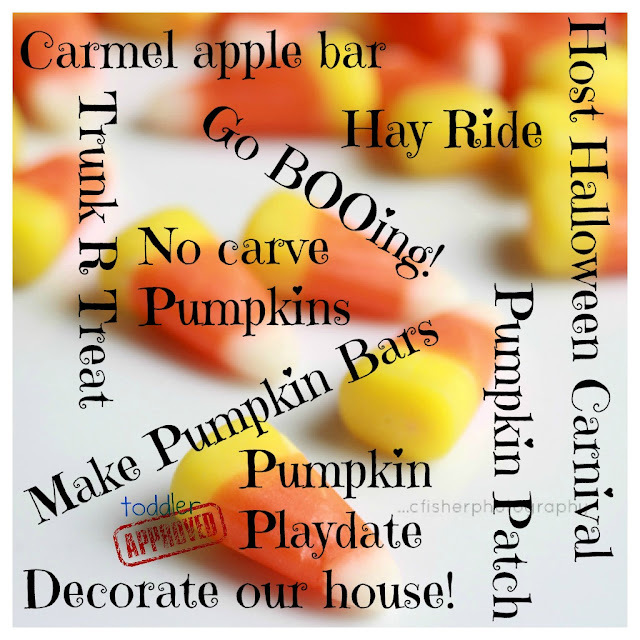 There are so many awesome ways to decorate pumpkins without carving them (via Kids Activities Blog). I loved decorating some with buttons and ribbons last year and this year I want to try pumpkin drip painting (idea from The Imagination Tree) and toy piece pumpkins. 7. 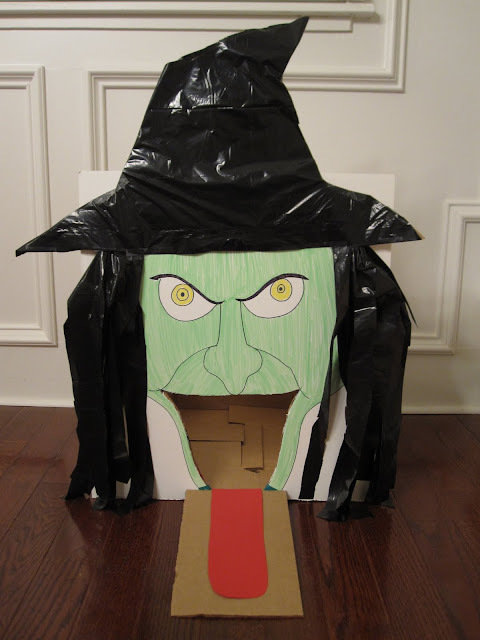 Host a Halloween Carnival. This is an annual tradition. Last year I helped host a fun neighborhood Halloween carnival and I'm going to do one on a smaller scale this year. It should be fun! I'd love to hear what your favorite carnival games are! These were some of the homemade games I've created in the past. I've also been collecting ideas on my Halloween Carnival pinboard. Have you ever done this? I think it is a fun way to do something nice for other people and embed a little service into Halloween. The TomKat Studio has some fun free printables you can download. We join up with friends from church, people decorate cars, and kids go from trunk to trunk getting candy. It is a lot of fun and the kids dont't have to walk as much. The adults also get a lot of time to socialize and our church provides dinner. I love this tradition! We also go out and do traditional trick-or-treating on Halloween... but this event is usually held the Saturday before Halloween. 10. Host a Pumpkin Playdate. I think this idea from Coffee Cups and Crayons is such a fun one! I think trying to narrow down which pumpkin activities and crafts to do is going to be my only problem! I really want to try and make pumpkin pie playdough (idea from Childhood Beckons), so that will be a priority. Can you believe I've never made it? What else would you do at a pumpkin playdate? 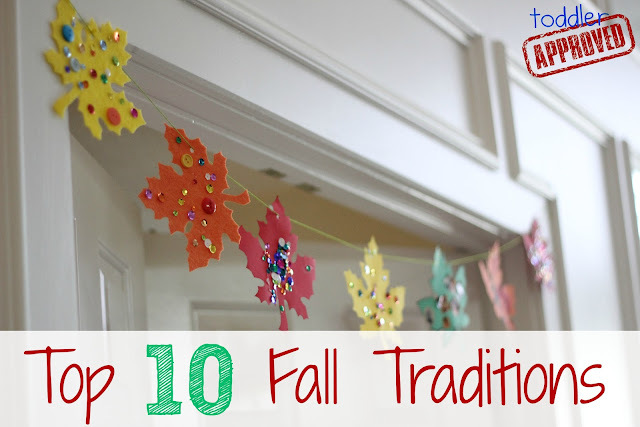 Do you have an favorite Fall or Halloween traditions? What is on your top 10 list? If you have any other favorite Fall or Halloween activities, come link them up in the Kid's Co-op Linky below! 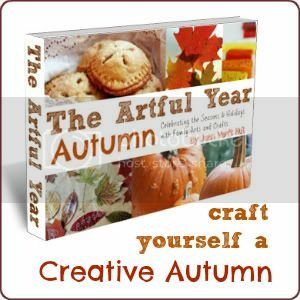 If you are looking for some more festive ideas, I highly recommend that you check out this beautiful e-book recently released by The Artful Parent. We like to plant Magic Pumpkin Seeds every year! 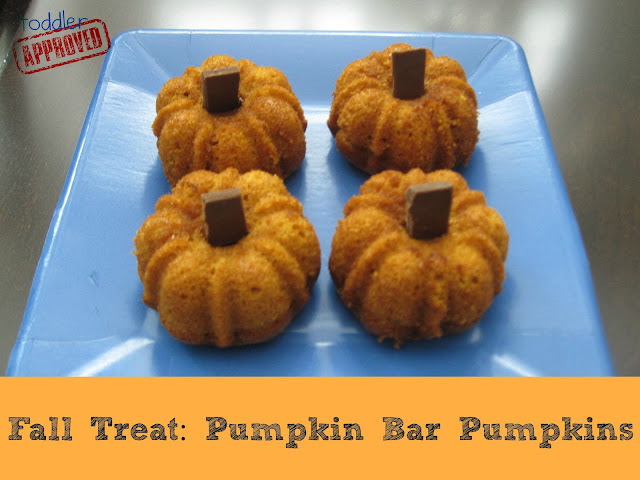 Do you have a recipe for those darling pumpkin bars? Your outdoor decorations from last year were fantastic!!! And at our next pumpkin play date we want to do pumpkin bowling!